ClearIAS Team has been receiving a lot of support and encouragement from our loving readers for our easy-to-understand articles on Geography. (See Major Ocean Currents: How to learn faster?) Having covered most of the important concepts in Lithosphere and Hydrosphere, in this article, we are going to discuss the composition and structure of the Earth’s Atmosphere in detail. We all know that earth is a unique planet due to the presence of life. The air is one among the necessary conditions for the existence of life on this planet. 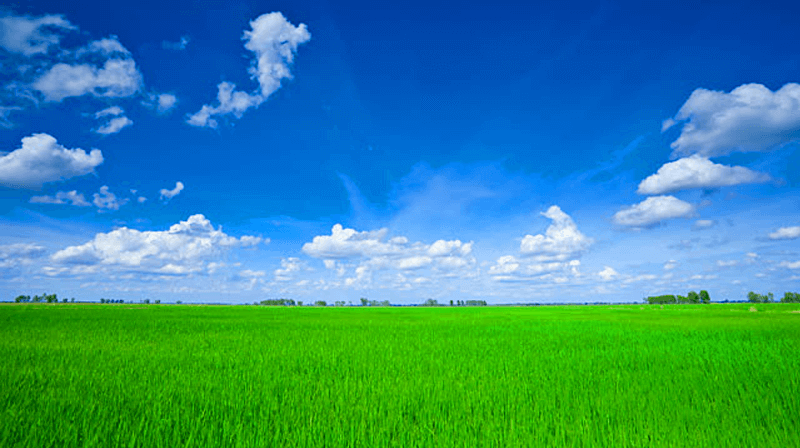 The air is a mixture of several gases and it encompasses the earth from all sides. The air surrounding the earth is called the atmosphere. The atmosphere is made up of different gases, water vapour and dust particles. The composition of the atmosphere is not static and it changes according to the time and place. 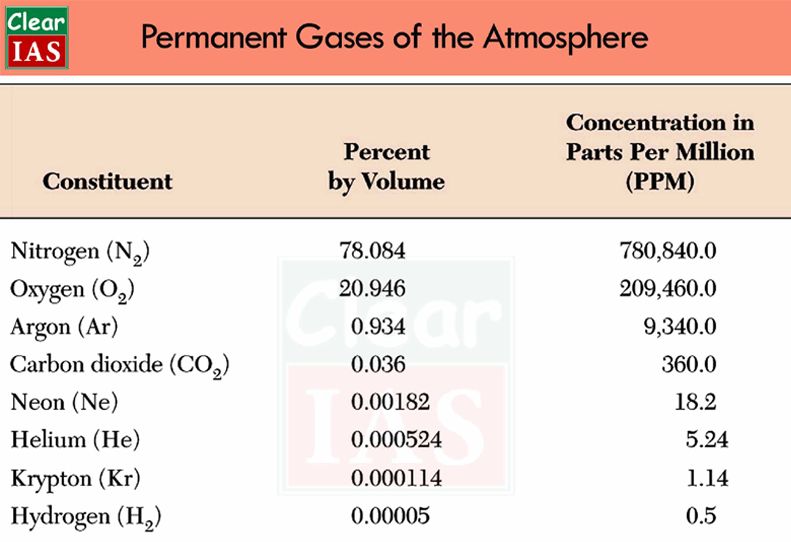 The atmosphere is a mixture of different types of gases. Nitrogen and oxygen are the two main gases in the atmosphere and 99 percentage of the atmosphere is made up of these two gases. Other gases like argon, carbon dioxide, neon, helium, hydrogen, etc. form the remaining part of the atmosphere. The portion of the gases changes in the higher layers of the atmosphere in such a way that oxygen will be almost negligible quantity at the heights of 120 km. Similarly, carbon dioxide (and water vapour) is found only up to 90 km from the surface of the earth. Carbon dioxide is meteorologically a very important gas. It is transparent to the incoming solar radiation (insolation) but opaque to the outgoing terrestrial radiation. It absorbs a part of terrestrial radiation and reflects back some part of it towards the earth’s surface. Carbon dioxide is largely responsible for the greenhouse effect. When the volume of other gases remains constant in the atmosphere, the volume of the carbon dioxide has been rising in the past few decades mainly because of the burning of fossil fuels. This rising volume of carbon dioxide is the main reason for global warming. Ozone is another important component of the atmosphere found mainly between 10 and 50 km above the earth’s surface. It acts as a filter and absorbs the ultra-violet rays radiating from the sun and prevents them from reaching the surface of the earth. The amount of ozone gas in the atmosphere is very little and is limited to the ozone layer found in the stratosphere. Gases form of water present in the atmosphere is called water vapour. It is the source of all kinds of precipitation. The amount of water vapour decreases with altitude. It also decreases from the equator (or from the low latitudes) towards the poles (or towards the high latitudes). Its maximum amount in the atmosphere could be up to 4% which is found in the warm and wet regions. Water vapour reaches in the atmosphere through evaporation and transpiration. Evaporation takes place in the oceans, seas, rivers, ponds and lakes while transpiration takes place from the plants, trees and living beings. Water vapour absorbs part of the incoming solar radiation (insolation) from the sun and preserves the earth’s radiated heat. It thus acts like a blanket allowing the earth neither to become too cold nor too hot. Dust particles are generally found in the lower layers of the atmosphere. These particles are found in the form of sand, smoke-soot, oceanic salt, ash, pollen, etc. Higher concentration of dust particles is found in subtropical and temperate regions due to dry winds in comparison to equatorial and polar regions. These dust particles help in the condensation of water vapour. During the condensation, water vapour gets condensed in the form of droplets around these dust particles and thus clouds are formed. It is the lowermost layer of the atmosphere. The height of this layer is about 18 km on the equator and 8 km on the poles. The thickness of the troposphere is greatest at the equator because heat us transported to great heights by strong convectional currents. Troposphere contains dust particles and water vapour. This is the most important layer of the atmosphere because all kinds of weather changes take place only in this layer. The air never remains static in this layer. Therefore this layer is called ‘changing sphere’ or troposphere. The environmental temperature decreases with increasing height of the atmosphere. It decreases at the rate of 1 degree Celsius for every 165 m of height. This is called Normal Lapse Rate. The zone separating troposphere from the stratosphere is known as tropopause. The air temperature at the tropopause is about – 80 degree Celsius over the equator and about – 45 degree Celsius over the poles. The temperature here is nearly constant, and hence, it is called tropopause. 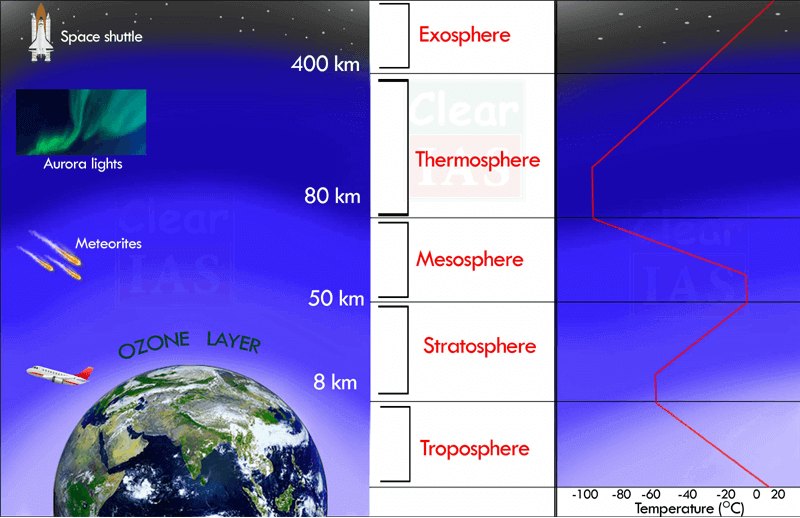 Stratosphere is found just above the troposphere. It extends up to a height of 50 km. The temperature remains almost the same in the lower part of this layer up to the height of 20 km. After this, the temperature increases slowly with the increase in the height. The temperature increases due to the presence of ozone gas in the upper part of this layer. Weather related incidents do not take place in this layer. The air blows horizontally here. Therefore this layer is considered ideal for flying of aircraft. The upper limit of the stratosphere is known as stratopause. One important feature of stratosphere is that it contains a layer of ozone gas. The relative thickness of the ozone layer is measured in Dobson Units. It is mainly found in the lower portion of the stratosphere, from approximately 20 to 30 km above the earth’s surface. It contains a high concentration of ozone (O3) in relation to other parts of the atmosphere. It is the region of the stratosphere that absorbs most of the sun’s ultra-violet radiations. It is the third layer of the atmosphere spreading over the stratosphere. It extends up to a height of 80 km. In this layer, the temperature starts decreasing with increasing altitude and reaches up to – 100 degree Celsius at the height of 80 km. Meteors or falling stars occur in this layer. The upper limit of the mesosphere is known as mesopause. This layer is located between 80 and 400 km above the mesopause. It contains electrically charged particles known as ions, and hence, it is known as the ionosphere. Radio waves transmitted from the earth are reflected back to the earth by this layer and due to this, radio broadcasting has become possible. The temperature here starts increasing with heights. The exosphere is the uppermost layer of the atmosphere. Gases are very sparse in this sphere due to the lack of gravitational force. Therefore, the density of air is very less here. Very Nice article. It is very useful. Thanks for sharing this. Sir,can we get topics separately or objective types…. Your material is excellent, I am your regular user. Thanks for providing material free of cost . Sir thanks for providing material in sequence this was the only one thing which was not good in your material. Because continuity is very essential. Plz provide all material in sequence manner. Hi Nikhil, thank you for the feedback and great to know that readers like you value our content so much. We regularly update our most important notes in sequence manner in the link – https://www.clearias.com/downloads/. We hope you would find this helpful. It is very good and attractive note for all types students.